For the first time ever, rock legends The Who and Guns ‘n’ Roses will perform on the same night of Rio’s acclaimed music festival, Rock in Rio. RIO DE JANEIRO, BRAZIL – On September 23rd, British rock pioneers The Who will take to the stage at Rock in Rio for their first ever performance in Latin America. They will be joined later in the evening by legendary American rock group Guns ‘n’ Roses, making it the first time ever that the two groups have shared the same stage. 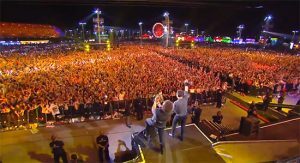 Celebrating its 32nd anniversary this year, the Rock in Rio festival will take place on September 18th, 19th, 20th, 24th, 25th, 26th, and 27th and will again be held in Barra da Tijuca’s Cidade do Rock, photo internet recreation. The Who’s two surviving original members, Pete Townshend and Roger Daltrey, will perform at Rock in Rio. The group, credited as an essential part of the rock and roll revolution in the 1960s, is responsible for hits including ‘My Generation’ and went on a world tour in 2014 to commemorate their fifty-year history. Guns ‘n’ Roses will follow, with three original members – Axl Rose, Slash and Duff McKagan – joined by Richard Fortus, Frank Ferer and Melissa Reese. The band famously performed in the Maracanã stadium in 1991, and also performed at the festival in 2001 and 2011, and is well-known throughout Brazil for hits such as ‘Welcome to the Jungle’. Both groups join an impressive international line-up, with Lady Gaga, Maroon 5 and Justin Timberlake among names recently announced to perform. Bon Jovi, Aerosmith, Red Hot Chilli Peppers and The Offspring are some of the accompanying international rock acts in this year’s line-up, with more names to be announced as the festival draws closer. Rock in Rio is one of Latin America’s most popular international music festivals, photo internet recreation. 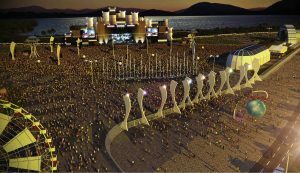 Rock in Rio has also announced a new Cidade de Rock (Rock City) has been constructed for the festival, located in the Olympic Park in Barra da Tijuca. The new space will feature a food court boasting a choice of fourteen different choices for hungry visitors, as well as a Hollywood-style boulevard commemorating artists who have previously played at the festival. The new Cidade de Rock will also have an area named Rock Street, with a large wooded area and two artificial lakes. This year, the area will have an African theme, featuring performances by musicians from countries including Mali, Burundi, Congo, Morocco and Guinea. An area for urban arts will also be part of the new Cidade de Rock, which is the seventh one constructed by the festival. With a graffiti-decorated stage, the Street Dance space will have an official crew of resident dancers performing a variety of urban dance styles. The festival will also feature its usual electronic stage, which has previously hosted acts such as David Guetta and Calvin Harris. Rock in Rio 2017 will take place in September, beginning on the 15th and with more acts on the 16th, 17th, 21st, 22nd and 23rd. The festival’s final day will be September 24th, with tickets available online.